ground" voter sentiment in a number of constituencies and a reinforcement of the fact the incumbent Dominica Labor Party (DLP)has been rigging the general elections in Dominica. Councilor Jason Fountain who was deviously removed from the village council by a DLP wolf pack reentered the bi election and in a convincing manner was still able to defeat the DLP backed candidate notwithstanding the money,building materials and cabinet support that was dispensed in the La Plain community. The plot to remove Jason Fountain from the La Plain Village Council was more about political posturing on the part of the DLP than the alleged unethical conduct by Jason Fountain. The irony is that if we are to begin expelling officers from public office, Petter St Jean would be at the top of the expulsion list particularly for the matter involving his ineligibility to contest the general elections of 2009. In functional society Peter St Jean would have also been terminated for his role in the dasheen gate scandal. A significant part of the DLP’s corrupt electioneering process is to have absolute control of all local government bodies and the purported illegal expulsion of Jason Fountain would have given them unfettered means to use the La Plain village council body to plunder and abuse public funds in the La Plain constituency. The outcome of Local government elections remains the proverbial barometer for political parties in Dominica and as expected the results of the recent bi election and the previous local government election in the La Plain constituency would be an eye opener for the incumbent DLP and supposedly a ray of hope for the opposition forces. However with the rampant corruption of the electoral process the PM Skerrit and the DLP may not be as unsettled as we would like to think as plans by the DLP are already in motion for the high day rigging of the next general election using mass importation of illegal overseas voters . According to very reliable sources the DLP have decided that the majority of the imported illegal voters will be transported via ferry service . The illegal imported voters coming out of North America will be routed through the Norwegian Airline into Guadeloupe and then loaded onto the Ferry into Portsmouth. We can also confirm that the DLP cabal had first considered working with a gentleman from Portsmouth residing in the US to purchase a ferry but that did not materialize. Sources close to the DLP informed us that the idea of routing people via ferry into Portsmouth had been considered much more favorable as the use of the ferry as oppose to air dropping voters would not only soften the image and lower the cost but that Portsmouth being the sheep pasture of the DLP would provide for less confrontation. The evil cabal was also concerned about the optics of grandeur and lavishness in airlifting thousands of illegal voters into Dominica when poverty, ‘rooflessness,” , unemployment , broken bridges and roadways etc is rife in Dominica. Has anyone ever considered how insulting ,demeaning and asinine it was when the DLP operatives to include Ian Douglas declared that the New Ferry Service operating out of Portsmouth would compensate for Ross University’s departure? Since the introduction of this new ferry service can the people of Portsmouth say that they have seen any real economic surge ? In fact what we have observed is that the new ferry service with the capacity of over 200 passengers would leave the Portsmouth port with an average of 6 passengers and on a good day 10-12 passengers. How is this new ferry service remaining in operation on such a low passenger turnout and with stiff competition from another established ferry service moving passengers traveling between St Lucia Guadeloupe with stops in Martinique and Dominica . Unless the new ferry service with its agents Clara House and Payless is being subsidized in some way or another it is inconceivable that the ferry Service would even consider doing business out of Portsmouth when the most viable source of business would have come from the Ross University students. So the million dollar question is – what prompted the New Ferry Service to even begin operation out of Portsmouth even after Ross University was gone . 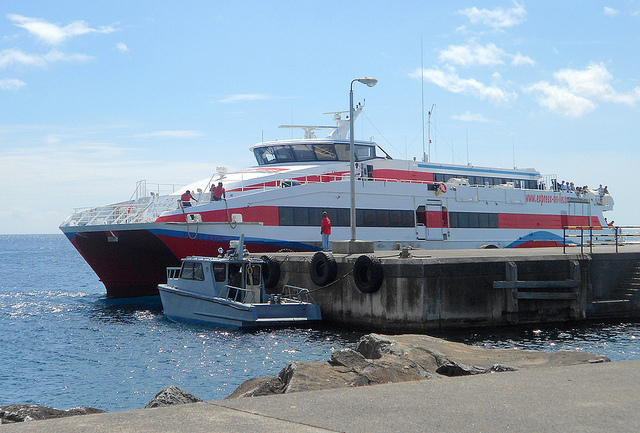 As of last week there have been advertisements that the very same new ferry service will now be operating out of Roseau as oppose to just Portsmouth and so the operators have now inserted themselves into direct competition with the long established ferry service , L’Express Des Lles. While we wish the new ferry service the very best we lament the fact that the business environment in Dominica is in doldrums and like many businesses that have disappeared under the Skerrit regime it may be just a matter of time before this new ferry service exits the Dominica market- Unless the service can outperform the well-established competitor or that this new ferry service is heavily subsidized.